The 5553467VSC Complete Vision System is a complete vision installation unit for our 5 phase stepper driven robots. It has a touch screen display with simulation preview. The vision system is supplied complete including PC, ensuring all components are compatible, thereby eliminating any costly start-up issues and reducing the learning curve. The system is designed to provide automatic dispensing program offsets when the dispensing path of a component cannot be guaranteed. Accepts CAD, DXF and Excel formats for dispense paths. Commonly uses two fiducal points are used to provide program offsets, however one point is also possible. Optional LED's may be required depending on refractive surface. ​It is suggested that you contact an IDS representative before purchasing. An easy-to-use and simple to program software package comes ready to be installed on the chosen robot unit. Complete with cables to reduce setup and downtime for your vision installation. 5553467VSC includes our Basic Syringe Dispenser, or choose the advanced 5553467VSC-AV system with the Auger Screw valve for the highest precision deposits available - Common for solder paste. SHIPPING COST INCLUDED IN PRICE - anywhere in the Continental USA that can receive loading dock shipments. Special "White Glove" delivery available for customers without a loading dock upon request for additional cost. Includes the 5553467VSC robot with vision, our Basic Syringe Dispenser pneumatic syringe controller that works with 30cc or 55cc pneumatic syringes, the teach pendant, IO cable, Syringe mount, and Touch screen display with simulation preview. The vision system is supplied complete including PC, ensuring all components are compatible. Requires 1 regulated compressed air line, up to 100psi, each to function. 115V or 230V power supply. Availability: 6-8 week build time normal. Need multiple units? Contact IDS directly for a quote. If you have never used this system with your material, be sure to speak with an IDS employee before ordering. 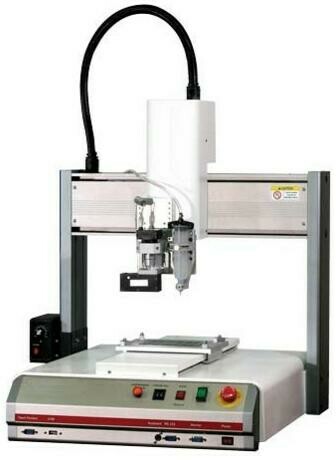 Includes the 5553467VSC robot with vision, our DPAV-200DAK-PKG Auger Screw Valve Station that works with 30cc or 55cc pneumatic syringes, the teach pendant, IO cable, Syringe mount, touch screen display with simulation preview. The vision system is supplied complete including PC, ensuring all components are compatible.